Joseph Anthony Mantegna (/mænˈteɪnjɑː/, Italian pronunciation: [manˈteɲɲa]; born November 13, 1947) is an American actor, producer, writer, and director. Mantegna began his career on stage in 1969 with the musical Hair. He earned a Tony Award for Best Featured Actor in a Play for portraying Richard Roma in the first American production of David Mamet's play Glengarry Glen Ross, the first of many collaborations with Mamet. Mantegna was awarded the Tony and Joseph Jefferson Awards for his role in David Mamet's Pulitzer Prize–winning play Glengarry Glen Ross. His long-standing association with Mamet includes the premieres of A Life in the Theatre, The Disappearance of the Jews and Speed-the-Plow on Broadway. Expanding to film and television, Mantegna is best known for his roles in box office hits including Three Amigos (1986), The Godfather Part III (1990), Forget Paris (1995), and Up Close and Personal (1996). Since 2007, he has starred in the CBS television series Criminal Minds as FBI Supervisory Special Agent David Rossi. Beginning with the 1991 episode "Bart the Murderer", Mantegna has voiced the recurring role of mob boss Fat Tony on the animated series The Simpsons, as well as The Simpsons Movie (2007). Mantegna has starred in the television series First Monday (2002) and Joan of Arcadia (2003–2005). He earned Emmy Award nominations for his roles in three different miniseries: The Last Don (1997), The Rat Pack (1998), and The Starter Wife (2007). He has also served as executive producer for various movies and television movies, including Corduroy (1984), Hoods (1998), and Lakeboat (2000), which he also directed. Additionally, he played Robert B. Parker's fictional detective Spenser in three made-for-TV movies between 1999 and 2001, and has narrated a number of audiobook readings of the Spenser novels. An avid firearms enthusiast, he is the host of MidwayUSA's Gun Stories on the cable television Outdoor Channel. Of Italian, Apulian and Sicilian descendance, Mantegna was born in 1947 in Chicago, Illinois. His parents were Mary Ann (Novelli), a shipping clerk from Acquaviva delle Fonti, Apulia, Italy who died in 2017 at the age of 101, and Joseph Henry Mantegna, an insurance salesman from Calascibetta, Sicily who died in 1971 of tuberculosis. Mantegna was raised Catholic and attended J. Sterling Morton High School East in Cicero, Illinois. He studied acting at the Goodman School of Drama at DePaul University from 1967–69. As a young man in Chicago, he played bass in a band called The Apocryphals, which later played with another local group, The Missing Links, who went on to form the band Chicago. Mantegna is still very close to the original members of Chicago and keeps in touch with his old bandmates as well. Mantegna made his acting debut in the 1969 stage production of Hair and debuted on Broadway in Working (1978). He co-wrote Bleacher Bums, an award-winning play which was first performed at Chicago's Organic Theater Company, and was a member of its original cast. In the movie Xanadu (1980), he had a small role which was cut, although since his name is in the film's credits, Mantegna gets residuals for the film. Mantegna won a Tony award for his portrayal of Richard Roma in David Mamet's play Glengarry Glen Ross. He has had a long and successful association with Mamet, appearing in a number of his works. Mantegna made his feature film debut in Medusa Challenger (1977). He played womanizing dentist Bruce Fleckstein in Compromising Positions (1985). He starred in an episode of The Twilight Zone in 1985 called Shelter Skelter. His other early film roles were supporting performances in The Money Pit (1986), Weeds (1987) and Suspect (1987). He also starred in the critically acclaimed movies House of Games (1987) and Things Change (1988), both written by Mamet. He and Things Change co-star Don Ameche received the Best Actor Award at the Venice Film Festival. In 1991, Mantegna starred in another Mamet story, the highly praised police thriller Homicide. Mantegna has played a wide range of roles, from the comic, as a jaded disc jockey in Airheads and an inept kidnapper from Baby's Day Out, to the dramatic, in roles such as Joey Zasa, a treacherous mobster in The Godfather Part III (1990) and an Emmy-nominated performance as singer Dean Martin in HBO's film The Rat Pack (1998). Mantegna has a recurring role in the animated series The Simpsons as the voice of mob boss Anthony "Fat Tony" D'Amico. He insists on voicing the character every time he appears, no matter how little dialogue he has. To quote: "If Fat Tony sneezes, I want to be there." However, in one instance, Phil Hartman voiced Fat Tony in the episode "A Fish Called Selma". Mantegna spoofed himself when he hosted Saturday Night Live for the 1990–1991 season in which he calmly began his monologue by saying he did not wish to be typecast from his gangster roles. A disappointed little boy and his father leave, as they mistakenly believed the host would be Joe Montana (football player) due to the similar names. Mantegna then began speaking in a low, controlled voice to the little boy, telling him it was best to stay in the audience and respect his performance; he warned the boy that if he (Mantegna) made a call, then Montana would not play in his next game—an implication that Mantegna's true personality equaled his gangster roles. In 2002, Mantegna starred as Associate Justice of the Supreme Court of the United States, Justice Joseph Novelli, on the CBS midseason replacement drama First Monday. Mantegna received the Lifetime Achievement Award on April 26, 2004, at the Los Angeles Italian Film Festival. 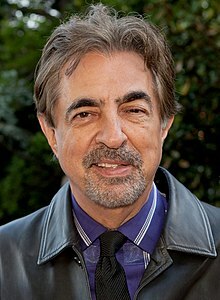 On August 11, 2007, Mantegna signed on to replace departing star Mandy Patinkin on the CBS crime drama Criminal Minds. Since season 9, he has directed several episodes as well. Since 2006, he has co-narrated the National Memorial Day Concert on the Mall in Washington D.C. with Gary Sinise. In 2016 he took part in an event at the Los Angeles County Museum of Art reading some of Gabriele Tinti's poems about Hercules. On April 29, 2011, Mantegna received the 2,438th star on the Hollywood Walk of Fame. On June 6, 2011, Mantegna's hometown of Cicero celebrated his body of work with an honorary street sign—Joe Mantegna Boulevard—on the northeast corner of Austin Boulevard and 25th Street, the location of his high school. In 2014, Mantegna received a star on the Italian Walk of Fame in Toronto, Ontario, Canada. On April 4, 2015, Mantegna received a Lifetime Achievement Award for Film and Television from The Riverside International Film Festival. On May 22, 2015, Mantegna received the Saint Pio Award from the Saint Pio Foundation, in recognition of his outstanding contribution in being an extraordinary individual in "providing relief from suffering to those in need". On May 3, 2017, the city of Chicago dedicated Joe Mantegna Way, a section of Armitage Avenue where Mantegna lived during his early acting days. Mantegna married Arlene Vrhel on October 3, 1975. He said in an interview on The Talk that the 300th episode of Criminal Minds aired on October 3, 2018, their 43rd wedding anniversary, and he apologized during that interview for working on their anniversary. They have two daughters: Mia and Gia. Arlene owned a Chicago-themed restaurant in Burbank, California, named Taste Chicago, which closed on March 22, 2019, for personal reasons. Mia, born 1987, is autistic and works as a make-up artist. She has also appeared with her father on KCAL-TV in support of Autism Awareness Month (April). Gina was born in 1990 and changed her name to Gia at age eighteen. Mantegna is a Chicago Cubs fan and has led the singing of "Take Me Out to the Ball Game" during the 7th inning stretch multiple times. This was referenced in the show Criminal Minds where his character David Rossi's office is decked with Cubs gear. In 1988 during the play Speed the Plow, Mantegna was stricken with Bell's Palsy. Although considered temporary, Mantegna still has persisting facial characteristices of the disease he considers a "stress-related illness", but this has not affected his acting career. 1981 It's a Living Louis Allen Episode: "Of Mace and Men"
1981 Bosom Buddies The Shiek Episode: "The Road To Monte Carlo"
1981–1982 Open All Night Change / Arab Episodes: "Night Moves", "Centerfold", "A Visit from the Folks"
1982 The Greatest American Hero Juan Episode: "Now You See It"
1982 Archie Bunker's Place Joe Garver Episode: "Of Mice and Bunker"
1982 Simon & Simon Henry Episode: "Emeralds Are Not a Girl's Best Friend"
1987 The Twilight Zone Harry Dobbs Episode: "Shelter Skelter"
1991 Saturday Night Live Host Episode: "Joe Mantegna"
1993 Fallen Angels Carl Streeter Episode: "The Quiet Room"
1993 Frasier Derek Mann Voice role; episode: "I Hate Frasier Crane"
1997 Duckman Rube Richter Voice role; episode: "A Star is Abhorred", "Love! Anger! Kvetching!" 1997 Rugrats Diner 2/Jack Montello Voice role; episode: "The Mattress/Looking for Jack"
2006 Kim Possible Jimmy Blamhammer Voice role; episode: "And the Mole Rat Will Be CGI"
2016–2017 Criminal Minds: Beyond Borders David Rossi Special guest; episodes: "The Harmful One", "II Mostro"
2017 Hell's Kitchen Himself Episode: "Raising the Bar"
2011 QuickBites Episodes: "Faceless", "Sack Lunch"
2014–present Criminal Minds Episodes: "The Road Home", "Anonymous", "Til Death Do Us Part", "The Sandman", "Mirror Image", "True North", "False Flag", "The Dance of Love", "Luke"
^ "Joe Mantegna - National Memorial Day Concert - PBS". www.pbs.org. ^ "Gun Stories presented by MidwayUSA – Hosts". Outdoor Channel. ^ Ryan, Maureen (October 30, 2007). "Joe Mantegna Replaces Mandy Patinkin in "Criminal Minds" 8 p.m. Wed. CBS". The Annotico Report, Chicago Tribune. Archived from the original on January 4, 2009. Retrieved September 19, 2008. ^ Chicago Tribune, Death Notices, April 9, 2017. ^ "Joe Mantegna Biography". Filmreference. Retrieved September 19, 2008. ^ "CiaoDC.com Interview with Award-Winning Actor, Joe Mantegna" (PDF). CiaoDC. Archived from the original (PDF) on May 27, 2014. Retrieved April 1, 2014. ^ "Joe Mantegna". Yahoo! Movies. Retrieved September 19, 2008. ^ Sanello, Frank (October 6, 1991). "Casting change With thanks to David Mamet, actor Joe Mantegna is his own man". Chicago Tribune. ^ "Joe Mantegna". BuddyTV. Archived from the original on September 22, 2008. Retrieved September 19, 2008. ^ a b Liz (May 25, 2007). "Catching Up with Joe Mantegna". The Washington Post. Retrieved September 19, 2008. ^ Rabin, Nathan (April 21, 2009). "Joe Mantegna". A.V. Club. Retrieved October 20, 2012. ^ "Joe Mantegna | TV Guide". TVGuide.com. Retrieved September 28, 2018. ^ Walton, Dawnie (August 11, 2008). "Mantegna Joins 'Criminal Minds' | The CBS series finds its replacement for Mandy Patinkin, after negotiations with Harvey Keitel fall apart". Entertainment Weekly. Retrieved September 19, 2008. ^ Mitovich, Matt Webb (August 11, 2007). "Criminal Minds Trades Inigo Montoya for Joe Mantegna". TV Guide. Archived from the original on October 13, 2008. Retrieved September 19, 2008. ^ Los Angeles County Museum of Art (June 2, 2016). "Event /// Hercules: Dramatic Reading of Gabriele Tinti's poem by Joe Mantegna" – via YouTube. ^ "Chicago Actor Joe Mantegna Honored with a Star on Hollywood's Walk of Fame". 2011. ^ "Inductees 2014 - The Italian Walk of Fame". www.italianwalkoffame.com. ^ "Riverside International Film Festival includes movie filmed at Edwards Mansion in Redlands". Redlands Daily Facts. April 2, 2015. Retrieved September 28, 2018. ^ "Actor Joe Mantegna To Get Stretch Of Armitage Named For Him Wednesday". DNAinfo Chicago. Archived from the original on November 9, 2017. ^ "Authentic Chicago Style Italian food in California!". Taste Chicago. Retrieved September 19, 2008. ^ a b "Joe Mantegna – When Life Flips the Script". ABILITY Magazine. Retrieved October 10, 2012. ^ "A Father's Love: Actor Joe Mantegna on his Daughter's Autism". Brain World Magazine. April 6, 2012. ^ mickeynews.com Archived July 20, 2006, at the Wayback Machine, writing "James Denton ... applauded hosts of the organization's autism awareness public service announcements, including celebrity parents of children with autism, Ed Asner, Gary Cole, Joe Mantegna, and John Schneider." ^ "Cubs to tweak guest-singer rules". ESPN. February 28, 2013.